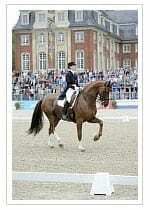 Are you looking for a new venue for your Horse Show or need additional show arenas for your show? With the Interlocking Event Mats you have the flexibility to transform any venue or performance space quickly and effectively into a World-Class Horse Show stadium. The special footing mats are laid directly onto lawn, turf or concrete and protect the grass from getting ruined. A nice layer of geotextile sand footing is added. After your event, the mats can be easily removed and stored for your next show. 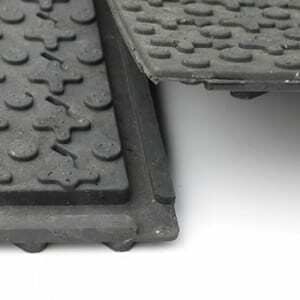 The Interlocking Event Mats are designed for long- and short term use, are easily installed, the structured surface of the mat adds stability to the sand footing, removal with the tongue-and-groove system make them an excellent choice for temporary installation of Show Event arena footings for indoors and outdoors. Each year in August, the beautiful park in front of the Muenster Castle, Germany is being converted into an International Jumping and Dressage Venue. The interlocking Event Mats are laid down on the grass, then the pre-mixed GeoTextile arena footing is brought in. What a spectacular ‘backdrop’ for a Horse Show! This special venue is converted back to it’s original park setting after one week of showing. The perfect horse arena footing is easily built from the ground up. Only 4 people can lay 800 m2 = 8,600 f2 in only 4 hours. All these attributes make the Event Mat our # 1 choice for indoor riding arenas and for Show Events where the removal of the base and arena footing can easily be done.